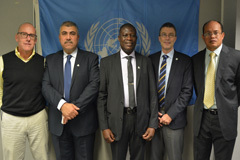 The Presidents of the conferences of the Parties to the Basel, Rotterdam and Stockholm conventions met on 3 November 2016 to discuss preparations for the joint bureaux meeting that was held from 3 to 4 November 2016 in Geneva, Switzerland. The Presidents, among other things, discussed the tentative schedule of work, including joint sessions on joint issues, for the meetings of the conferences of the Parties to the Basel, Rotterdam and Stockholm conventions, taking place from 24 April to 5 May 2017 in Geneva. The Presidents also discussed other organizational matters related to these back-to-back meetings, such as the high-level segment.